This yardstick photo holder was also shared on my blog recently. If you missed it, you can click on the link to see the tutorial. 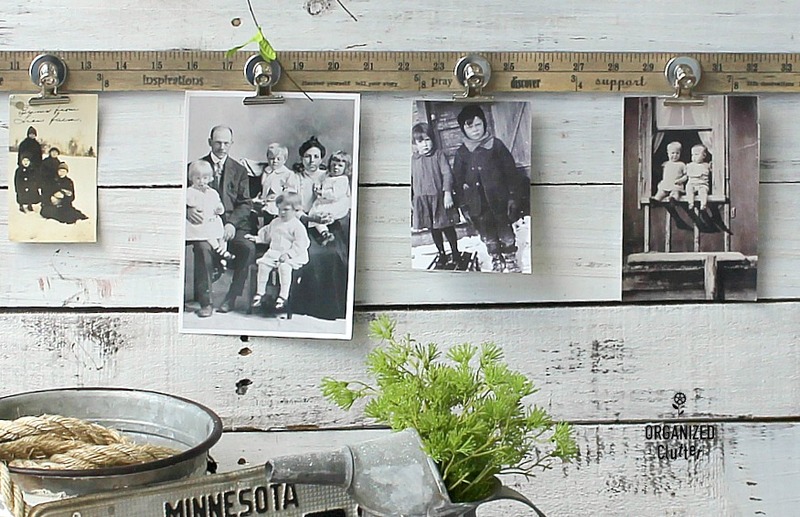 Yardstick Photo Holder With Clips. 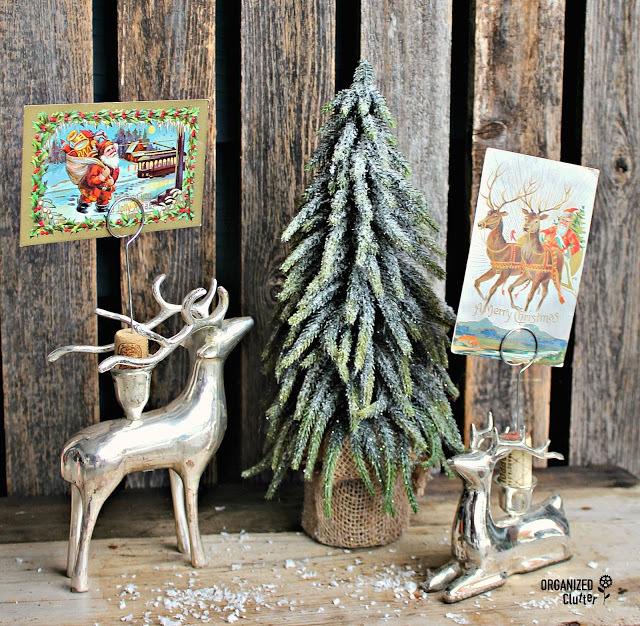 These Wine Cork/Candlestick Photo/Card Display Holder from last Christmas could display old photos as well as Christmas cards. 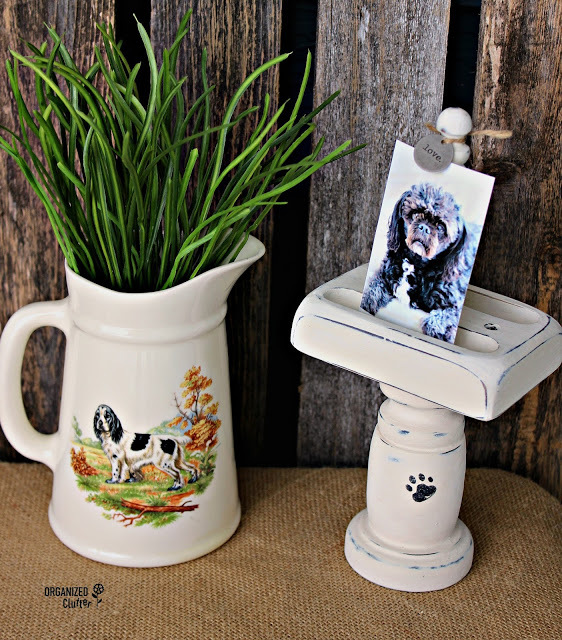 Here a Vintage Playing Card Holder On A Candlestick became a fun pet photo holder with a small paw print stencil. When I found this safety grater last fall, I thought it looked like a pumpkin (or it could if I made it one). 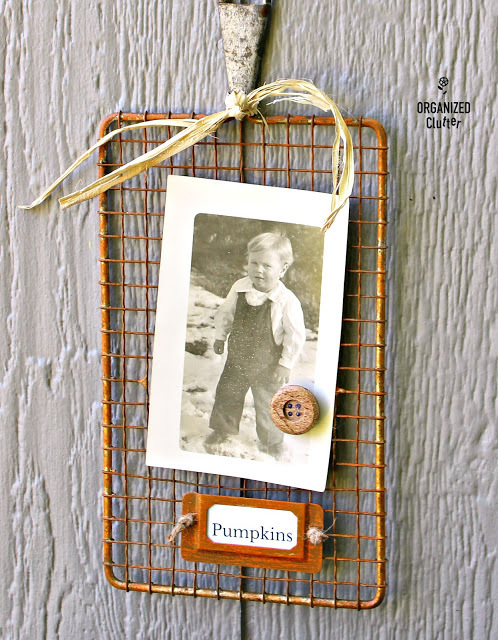 Details here for this Vintage Safety Grater Pumpkin Photo Display. 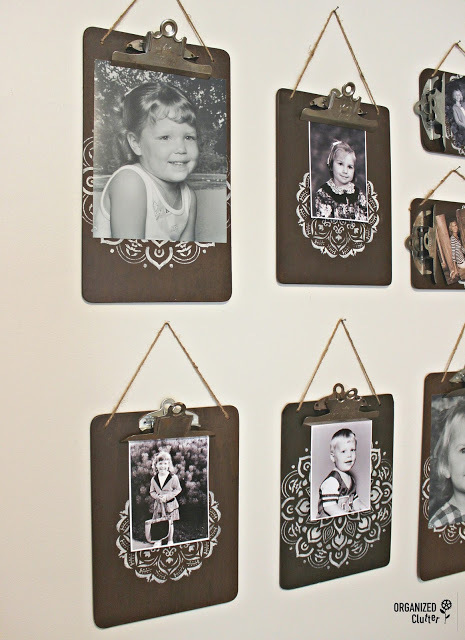 Childhood black and white photos of my kids are displayed on a Stenciled Clipboard Photo Gallery Wall in an extra bedroom. 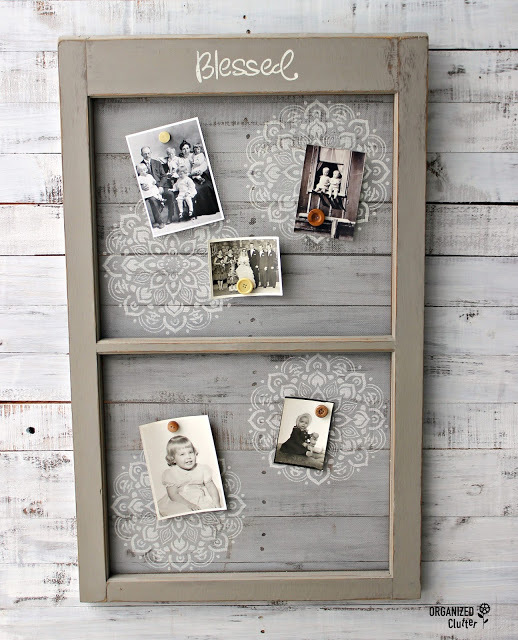 This Painted/Stenciled Vintage Metal/Wood Window Screen with mandala stencils is one of my favorite photo holders! What to do with broken chairs? Make a Chair Back Rail Photo Display. My pretty mom hangs on this Chair Back Photo Frame in our hallway. Another Grater Chippy Cabinet Panel Photo Holder with Button Magnets here. This is a really fun piece that hangs in my hallway, unfortunately with poor natural lighting. 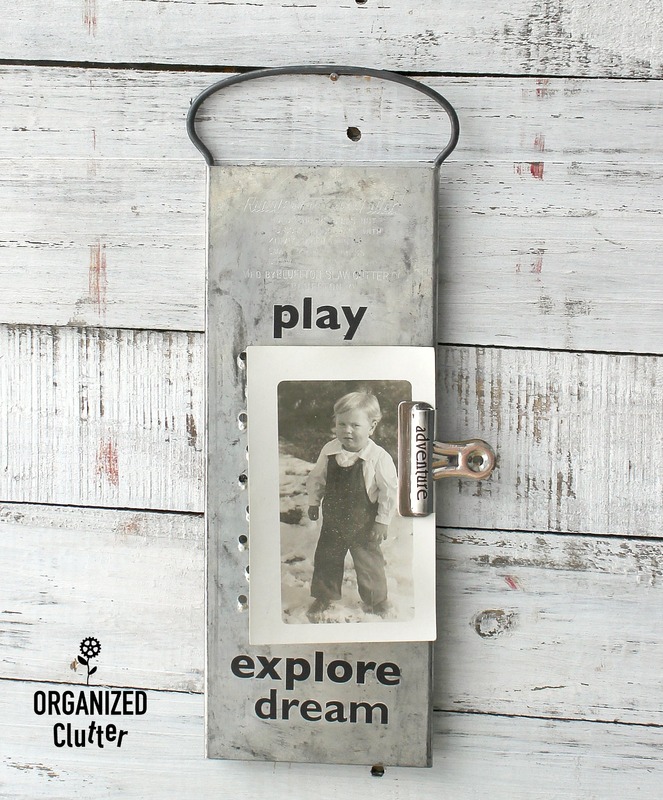 Check out the details on my Vintage Crib Rail Baby Photo Display. 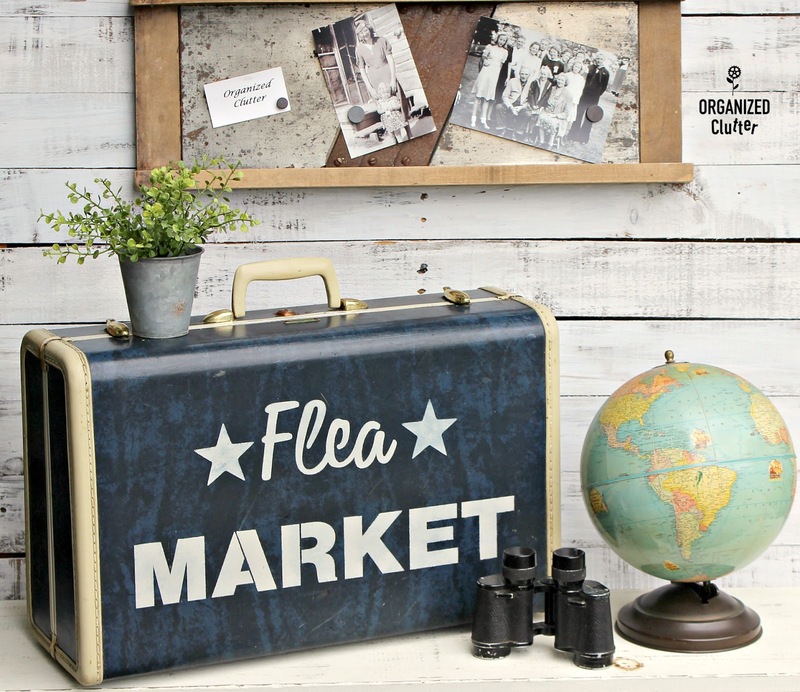 Why not display a small photo in a Post Office Box Frame window? I'll show you how if you follow the link. My grandparents wedding photo is displayed on the wall on what was a Wall Note Pad Holder from the thrift shop! My grandma and her older sister's photo frame is held on the wall by a Ritz Shoe Size Measure Photo Holder, just for the fun of it! 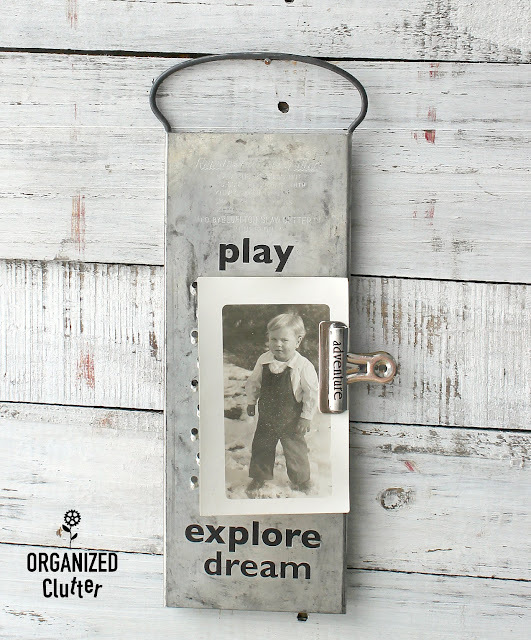 This Wall Mail Organizer to Clipboard Style Photo Display started out with wooden pigs to hold the mail. This Clipboard Style Photo Display with my grandkids' photo was an ugly thrift shop tavern sign. My mom's school picture looks great on a Scrap Wood Rustic Photo Clipboard! One of my first horseback rides at a local carnival hangs in this Clothes Hanger Frame Holder. 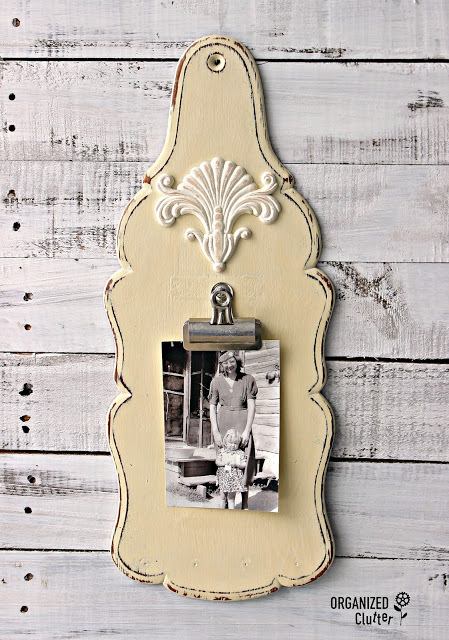 Great grandma and grandpa's wedding photo is displayed in an Upcycled Trouser Hanger Photo Holder! This is my most popular photo display on Pinterest! Painted Grater with Easel Back and Label. I love to display photos with magnets on slaw cutters too! 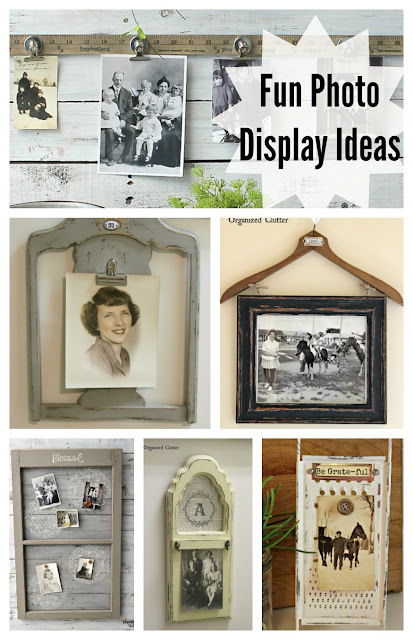 I hope you found some ideas for your photo displays!